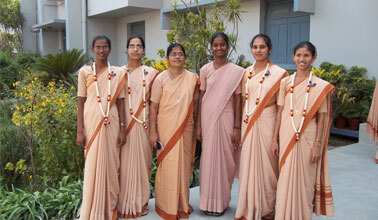 A long awaited day was dawned on 24th May for the eight Novices. The day awakened with the melodious music. 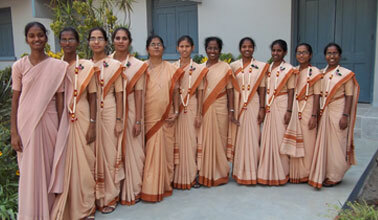 Even in the life of these Novices a new dawn of life was begun with the Morning Prayer. As they were ready to offer themselves to God in love for the greater glory of Him. My heart was overwhelmed with joy to witness this great day. Fr. Abraham, who prepared these Novices to make their vows, was the main celebrant for the Mass at 10:30 a.m. The Novices were welcomed to the Chapel with an entrance dance, arati, and tigga. To witness this great day of commitment many religious were present there. One of our special guests was Bro. Peter, Sr. Shruti’s brother from Punjab. 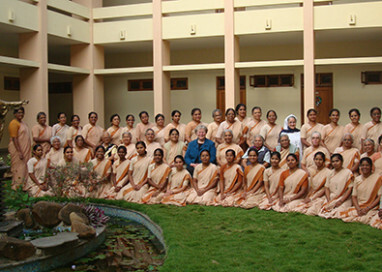 As the Novices made their vow to God, into the hands of Sr. Mary Sandhya and Sr. Mary Beena, the entire community of the Sisters accepted the newly professed Sisters to our Congregation. It was a day of fulfilment in the lives of these Sisters and joy for all of us as they offered the “New Dawn of Life” to God. The newly professed Sisters are: Srs. 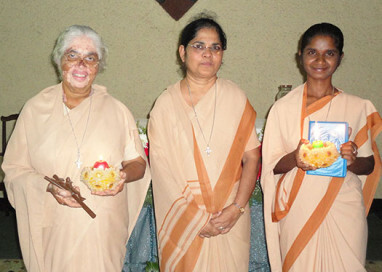 Mary Premalatha, Triveni, Shruti, and Chrisina Kiran for Bangalore Province; Srs. Mary Crecencia, Monica Soren, Magdaleena, and Monica Rose for Patna Province. All the best and God’s abundant blessings upon you as you begin your new mission.